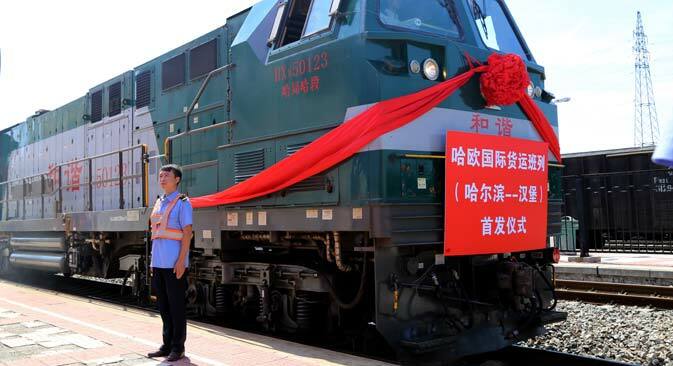 China launched the world’s longest freight train route which links the city of Harbin in northeast China with the German city of Hamburg, via Russia’s Trans-Siberian line, Xinhua said, citing the managing director of the Harbin-Europe international logistics company, Tu Xiaoyue. Xiaoyue told the news agency that the Harbin-Hamburg train route has high commercial value and low logistics costs, since it takes half as much time as the current road and sea trade routes. The first train on the route set off on June 13. The journey takes 15 days, passing through Mongolia, Russia, Belarus and Poland. On the Chinese-Mongolian and the Belarusian-Polish borders, the train will have to have its bogies changed to overcome differences in the track gauge. The service will run once a week. The new route is 9,820 km long, making it the longest of the existing transcontinental trade routes. Similar cargo train services to Europe, using the Trans-Siberian Railway, run from several other Chinese cities, including Chongqing, Chengdu, Changsha, Hefei, Yiwu and Suzhou. The Harbin-Hamburg route will be used to transport electronic equipment, automotive parts and clothes manufactured in north and northeast China. German auto giants Mercedes Benz and Audi as well as Taiwan’s electronics manufacturer Foxconn have already announced their intention to use the new route, China’s English-language New China TV channel reports. According to the Chinese website CRI, the new train route will transport cargoes worth over 4 billion yuan (over $650 million) a year. China is making active use of the Trans-Siberian Railway to transport its cargoes. Several days before the launch of the Harbin-Hamburg freight route, another cargo train route came into fruition, linking Xinjiang's capital Urumqi and Moscow. In addition, in January 2015, China announced that it would build a high-speed 7,000-km-long railroad linking Beijing and Moscow. The cost of the project is estimated at 1,500 billion yuan ($242 billion). The first section of the route, between Moscow and Kazan, is planned to be completed by 2017. China is also interested in the Russian Far East. In May 2015, the authorities of the Chinese province of Jilin invited the government of the Russian Primorye Territory to jointly build a high-speed rail link between Vladivostok and the city of Hunchun (on the China-Russia border). The Chinese authorities plan to build the first stretch of the route, to Hunchun, as early as by August 2015. “If we manage to extend it together, it will be the first cross-border high-speed backbone between Russia and China,” said the first secretary of the Jilin Province Committee of the Communist Party of China, Bayin Chaolu. Russian officials are ready to cooperate with China in the construction but may find it difficult to raise state and private investment inside the country. The project to build the Moscow-Kazan high-speed rail link was put on hold for a long time until Chinese investors agreed to finance it. In addition, the project to build the Russian section of the bridge across the Amur, which should link the Russian and Chinese railroads, still remains up in the air. An intergovernmental agreement on building the new bridge was signed back in 2008. China undertook to do the bulk of the work (1.9 out of the total 2.2 km) and plans to complete its section by the end of 2016. Whereas the relevant Russian agencies failed to start building their section of the bridge over “organizational and managerial difficulties”, the Vedomosti business newspaper reported on April 20, 2015.